New Mixed Hybrid for making "Artificial-Bonsai Seedlings"
Glad to see you guys again. “Born to be Bonsai” for this article is my personal quote for “Artificial Adenium-Bonsai Seedlings”, not related with real organized Bonsai. From my experiences, I have found that not only all Adenium seedlings can perform as Dwarf or Compact Seedling form but only 10% can do. 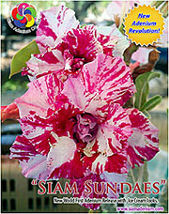 On that time, I focused on only TRUE hybrid from mother plants themselves mostly on Arabicums or Thai Socotranums. Table below is shown that what good or weak point for each hybrid I have found. What happened if we can pull up each good point from both of them? This idea was popped up to me. One thing I had to do is to cross them. I was thinking what form I would get from this crossing? The funniest part is which variety from each hybrid I’m gonna use to make perfect seedlings because we have 11 varieties from Arabicums and 5 varieties from Thai Socotranum, more information on their varieties please click the “hybrid” at menu header. This is the same imagination with Obesum’s crossing to make nice and beautiful flowers. For Obesum we use color, flower form, leaves, and etc. to make new nice varieties. What is the perfect form from this crossing? The result I’ve got from this are nice spread root, shorten caudex neck, symmetric branches come up with middle main stem. The hardest part is nice root growing. I prefer adeniums to grow their roots themselves not be organized by human because this will be more beautiful and classic. This is following up with Bonsai concept. I have never called this is for real Bonsai as you have seen. This is just Artificial Bonsai grown from seedlings. Unfortunately, only 30% can come up with this Bonsai class. The rest will show with much more Arabicum and Thai Socotranum (Please see the photo below). Can we make it more than 30% with Bonsai seedling form? The answer is “YES” because this was just for F1 generation. You can get more on F2 and F3 generations. You can get more fun if you do “Back Cross” from F4 with her own original mother plants. I will discuss this later. Actually I like adeniums grown with perfect or Bonsai form by nature themselves, not use any boost growth chemical to dope or inhibit chemical to make them dwarf or compact, form will be lose when they grow up in the future or lack of these chemicals. For example, you know well that Thai ocotranum grow slowly but you can boost her growth up with using Arabicum hybrid, faster growth, to mix in her blood or crossing her. Our Mixed Hybrid seedlings with age 1.5 Yrs. For adenium players who wanna grow with normal way. I will share the idea how to do next time. Ok, this is it for today. If you have questions, please feel free to email me. Thanks a lot and have a nice day.